The Blind Spot Warning (BSW) system helps alert the driver of other vehicles in adjacent lanes when changing lanes. The Lane Departure Warning (LDW) system helps alert the driver when the vehicle is traveling close to either the left or the right of a traveling lane. The BSW/LDW systems use the rear view monitor camera unit 1 with automatic washer and blower. ● The BSW system is not a replacement for proper driving procedure and is not designed to prevent contact with vehicles or objects. When changing lanes, always use the side and rear mirrors and turn and look in the direction you will move to ensure it is safe to change lanes. Never rely solely on the BSW system. 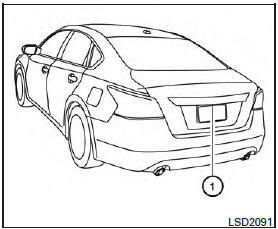 ● The LDW system is only a warning device to help inform the driver of a potential unintended lane departure. It will not steer the vehicle or prevent loss of control. It is the driver’s responsibility to stay alert, drive safely, keep the vehicle in the traveling lane, and be in control of the vehicle at all times. ● The camera unit may not function properly under the following conditions: – When towing a trailer. ● If the camera lens is excessively dirty, the automatic washer may not be able to completely clean the lens. This could result in the camera not detecting vehicles or lane markers. ● Excessive noise (e.g. audio system volume, open vehicle window) will interfere with the chime sound, and it may not be heard.